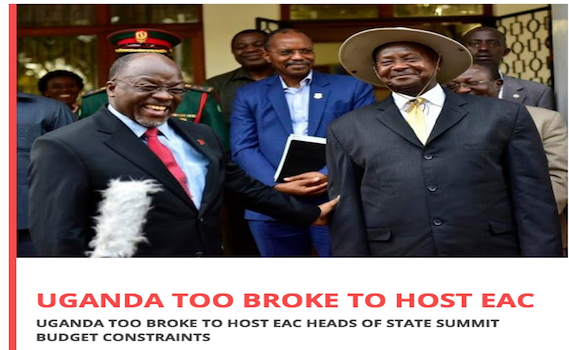 Press Reports indicate that Uganda is facing budget constraints, which they say may affect the country’s plans to host the East African Community heads of state summit this year. The line ministry is reported to have told parliament that it faces financial challenges. Apparently Uganda needs more than Shs1 billion (Rwf230m) to host the summit but the ministry of East African Community Affairs’ annual budget stands at only Sh1.3 billion shillings. Julius Maganda, the State Minister for East African Community Affairs, told The Redpepper that his ministry is left with only Shs1.3 billion for administration and wages. “We cannot do our mandate to host the EAC heads of state summit based on the budget that we have, the money is small, we are trying within our best,” Maganda was quoted as saying. The Committee Chairperson, Tonny Onyoo, advised the government to “terminate that ministry” if it couldn’t support its activities to steer the integration process in the country.